Ioanna Zergioti is a Professor at the National Technical University of Athens, School of Applied Mathematics and Physical Sciences. She studied Physics at the University of Crete and she received the degree at the Foundation for Research and Technology-Hellas, for her work on the growth of thin nanocrystalline Carbide films and mechanisms using laser based process. In the framework of her PhD work she worked for the fall semester of 1996 in the Mechanical Engineering Department at the University of California, Berkeley on the Laser Induced Forward Transfer process. After her PhD, she worked as a post doctoral researcher in the Max Planck Institut für Biophysikalische Chemie in Göttingen, on Laser matter interactions studies. Then, she worked as a post-doctoral researcher in the Philips CFT on Laser Sintering of sol gels for electronics until 2000. She was a researcher for 4 years (1999-2003) at the Laser Applications Division of the Institute of Electronic Structure and Laser – FORTH, where she developed works on ultrashort laser microstructuring (etching and printing) of metals, oxides and biomaterials. 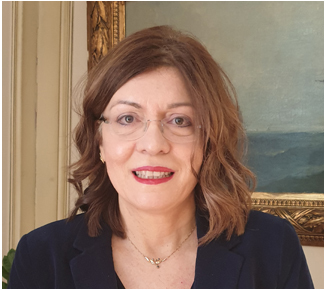 Since September 2003 she was appointed at the National Technical University of Athens, School of Applied Mathematical and Physical Sciences and since 2013 she is an Associate Professor. Her main activities are related to the laser microprinting of biological molecules and laser matter interaction studies for biotechnological applications and organic electronics. She has co-authored more than 95 publications in international refereed journals, 44 publications in conference proceedings, 8 chapters in scientific books, 3 granted Greek patents, 1 European patent and 2 PCT. She has co-organised CLEO, EMRS and COLA conferences. 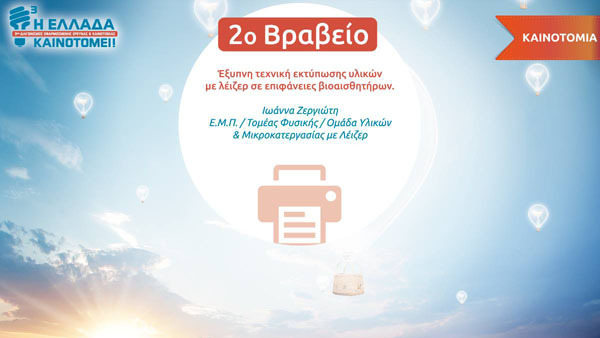 She is currently coordinating two European Research projects, a Marie Curie IAPP “LaserMicroFab” and an ICT “BIOFOS”, and one National Research project ΕΣΠΑ, ΣΥΝΕΡΓΑΣΙΑ 2011 (11ΣΥΝ_1_1799) "NANOTHER: Μαγνητικά νανοσωματίδια για στοχευμένη θεραπεία με χρήση μαγνητικής τομογραφίας". Filimon Zacharatos will present an invited talk entitled "Laser Direct Printing of nanomaterials for flexible electronic components and sensors" at International Conference on Ultrafast Optical Science (UltrafastLight-2018), which will be held in Moscow, Russia on October 1-5, 2018. Ioanna Zergioti presented the work entitled "Laser Direct Printing of advanced materials for flexible electronic components and sensors", on 17 September 2018. Filimon Zacharatos presented the work entitled "Laser Transfer of Ag nanowire networks and Au nanoparticle highly ordered arrays on flexible substrates", on 17 September 2018. Agamemnon Kalaitzis presented the work entitled "Jet dynamics of Newtonian and non-Newtonian fluids via LIFT: Experimental study and simulation", on 19 September 2018. Ioanna Zergioti presented an invited talk entitled "Laser direct-writing of flexible electronic components and sensors" and an oral talk entitled "Selective laser sintering of Ag nanoparticle micro-patterns at high repetition rates" at International Conference on Remote Sensing and Defence + Security, which was held in Berlin, Germany on September 10-13, 2018. Ioanna Zergioti presented an invited talk entitled "Laser Direct Printing of nanomaterials for flexible electronic components and sensors" at International Conference on Functional Nanomaterials and Nanodevices, held in Vienna, Austria on September 3-5, 2018. Ioanna Zergioti presented the work entitled "Fluid dynamics of jetting by means of Laser Induced Forward Transfer" at LPM 2018, which took place on June 25-28, 2018 in Edinburgh, Scotland, UK . The work entitled “Jet dynamics of Newtonian and non-Newtonian fluids via LIFT: Experimental study and simulation”. The work entitled “Laser-based, site-specific fabrication of protein-incorporated hydrogels on surfaces for biosensing applications”. Ιωάννα Ζεργιώτη συμμετείχε στο πολυσυνέδριο Hellenic Innovation Forum που πραγματοποιήθηκε την Τετάρτη 1 και Πέμπτη 2 Μαρτίου 2017 στο ξενοδοχείο Divani Caravel. The work entitled “Laser induced forward transfer technique for the immobilization of biomaterials in biosensors applications”. The work entitled “High-speed imaging and evolution dynamics of laser induced deposition of conductive inks”. Ο Σίμος Παπάζογλου παρουσίασε την εργασία με τίτλο "Laser printing of metallic and semiconducting nanoparticles inks for the fabrication of chemical sensors on flexible substrates" στο 6ο Πανελλήνιο Συνέδριο Μεταλλικών Υλικών, που πραγματοποιήθηκε στα Ιωάννινα 7–9 Δεκεμβρίου 2016. Ο Φιλήμονας Ζαχαράτος έδωσε ομιλία με τίτλο "Laser printing of functional materials" στην Ελληνογαλλική ημερίδα για την Επιχειρηματικότητα και την Καινοτομία στο ΦΟΡΟΥΜ ΚΑΙΝΟΤΟΜΙΑΣ, που πραγματοποιήθηκε στο Γαλλικό Ινστιτούτο Ελλάδος (I.F.G.) τη Παρασκευή 25 Νοεμβρίου 2016. Ioanna Zergioti presented a tutorial work entitled "BIOFOS: MICRO-RING RESONATOR-BASED BIOPHOTONIC SYSTEM FOR FOOD ANALYSIS " and an oral talk entitled "ALL LASER PRINTED RESISTIVE CHEMICAL SENSOR: FABRICATION AND EVALUATION" at the IEEE SENSORS 2016, which was held in Orlando, Florida USA on 30 October-2 November 2016. Ioanna Zergioti participated at the 2016 EU Research & Innovation Day, which was held in Seoul, Korea on 4 October 2016. Ioanna Zergioti presented the work entitled "Laser fabrication of a hybrid platform combining electrical and optical interconnects" at the XXXII Panhellenic Conference on Solid State Physics and Materials Science, which was held in Ioannina, Greece on 18-21 September 2016. Ioanna Zergioti presented an invited talk entitled "BIOFOS: Micro-ring resonator-based biophotonic system for food analysis" at the 4th Hellenic Forum for Science, Technology & Innovation which was held in Athens , Greece NCSR DEMOKRITOS CAMPUS on July 11-15, 2016. Ioanna Zergioti presented an invited talk entitled "Flexible platform for laser fabricated electrical and optical interconnects" at the 9th International Symposium on Flexible Organic Electronics (ISFOE16) which was held in Thessaloniki, Greece on 4-7 July 2016. Ioanna Zergioti presented an invited talk entitled "Biophotonics system for food analysis" at Nano-electronics Symposium of the European Innovation week which was held in Taipei, Taiwan on June 2, 2016. Ioanna Zergioti is a member of the scientific committee: The 17th International Symposium on Laser Precision Microfabrication which was held in Xi’an, China from May 23-26, 2016. Ioanna Zergioti presented the work entitled “Laser printing and patterning of conductive and carbon based materials and their applications”, with the following authors: M. Makrygianni, S. Papazoglou, F. Zacharatos, S. Chatzandroulis, I. Zergioti. Ioanna Zergioti presented the work entitled “Laser Induced Forward Transfer technique for the immobilization of biomaterials”, with the following authors: M. Chatzipetrou, M. Massaouti, S. Papazoglou, I. Zergioti. Ο Σίμος Παπάζογλου παρουσίασε την "Πρωτοποριακή τεχνική εκτύπωσης λειτουργικών υλικών και μικροδιατάξεων με λέιζερ" στην έκθεση Patras Innovation Quest 2016 (PatrasIQ 2016), που πραγματοποιήθηκε από 15 ως 17 Απριλίου 2016 στο αθλητικό κέντρο «Δημήτρης Τόφαλος», Πάτρα. Ioanna Zergioti presented an invited talk entitled “Laser induced forward transfer: A technique for 3D manufacturing of functional devices”, [9738-11]. Ioanna Zergioti presented the work entitled “Laser induced forward transfer: a novel tool for printing sensors and characterizing surface wetting properties”, [9735-13]. Ioanna Zergioti presented the European project “BIOFOS: micro-ring resonator-based biophotonic system for food analysis”, on 9 February 2015. Symeon Papazoglou presented the work entitled “All-printed reduced graphene oxide gas sensors,” on 10 February 2015. The authors of this paper are: Symeon Papazoglou, Marina Makrygianni, Myrto K. Filippidou, Stavros Chatzandroulis and Ioanna Zergioti. Symeon Papazoglou presented the work entitled “Raman study for drug delivery applications and tissue imaging”, on 9 February 2015. The authors of this paper are: Symeon Papazoglou, Ioannis Theodorakos, Maria Patitsa, Apostolos Klinakis, Ioanna Zergioti, Yannis S. Raptis. The paper, ““High speed laser transfer (LIFT), thin-film patterning and selective sintering of printed Ag nanoparticle inks for electronic device integration on flexible substrates” has been accepted for Poster presentation and was presented on 10 February 2015. The authors of this paper are: Filimon Zacharatos, Stéphanie Leyder, Riccardo Geremia, Daniel Puerto, E. Biver, Ludovic Rapp, Philippe Delaporte, Anne Patricia B. Alloncle, Dimitris Karnakis and Ioanna Zergioti. LaserMicroFab FP7-IAPP co-organised the workshop on “Laser Technologies for Organic & Printed Electronics” held at the 7th International Symposium on Flexible Organic Electronics 7-10 July 2014 in Thessaloniki, Greece. The primary goal of the workshop «Laser Technologies for Organic & Printed Electronics» was to promote laser technology and applications within the organic electronics community, focusing on both fundamental and applied issues concerning laser materials processing, characterisation and assessment, devices functionality, and applications. Ioanna Zergioti has given an invited talk entitled “Laser print and functionalize sensors” on 7 October 2014.